Steigerwald Lake is situated on the Columbia River floodplain in the southeasternmost part of the Puget Trough ecoregion and is the southernmost spot in the state. The refuge is in the process of developing a visitors' plan and trail system, and until that is finished, you can bird only from outside of the refuge boundaries. 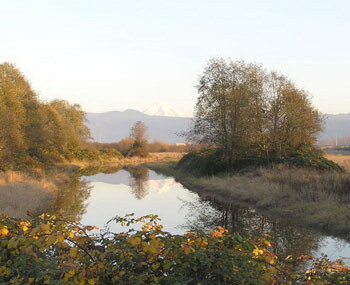 The dike between the Columbia River and the refuge offers good views both into the refuge and of the channel between the refuge and Reed Island. Reed Island is undeveloped state park land with a large Great Blue Heron rookery and is only accessible by boat. The rest of the refuge can easily be birded from the wide shoulders and paved pull-offs along Route 14. Steigerwald Lake is only about 1,000 acres in size, but over 200 species of birds have been found here, due in part to the refuge being at the mouth of the Columbia River Gorge's near-sea-level break (gap) through the Cascade Mountains. This allows birds normally considered typical for east of the Cascades to wander here during migration. Bird sightings have included White-faced Ibis, Prairie Falcon, Black-necked Stilt, American Avocet, Burrowing Owl, Lewis's Woodpecker, Gray Flycatcher, Ash-throated Flycatcher, Sage Thrasher, and Brewer's Sparrow. Uncommon west-side breeding passerine species that can be found here are White-breasted Nuthatch, House Wren, and Yellow-headed Blackbird. From the I-205 exit on to Route 14, travel east to milepost 15 and stop at Steamboat Landing on the Columbia River. Purple Martins nest in the park's dock pilings, and you scan the river for loons, grebes, and diving ducks. Continue east on Route 14 to milepost 17 and turn right on 32nd Street. Drive a few blocks south to Index Street to the William Clark Park parking area at the base of the dike. From here or the two parking spots farther east, you can walk for approximately three miles of top of the dike. Go back to Route 14, and turn right, stopping often during the next two miles to view the Washougal Sewage lagoons and the rest of the refuge.